Matt Thomas’ performance was vital in Valencia winning the EuroCup. Matt Thomas couldn’t have pictured a more ideal finale in his debut season in a continental European competition. After going 18 – 2 before the Finals, Thomas, and Valencia beat Alba Berlin 2-1 in the title series to win the EuroCup title for the fourth time in the history of the club. “This is incredible. This has to be one of the best atmospheres in Europe. I’m just happy to be here and happy to be a part of this,” Thomas said. 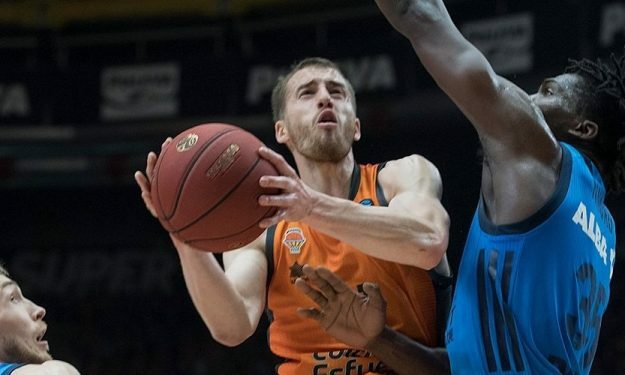 Thomas’ performance in Game 3 against Alba Berlin was crucial for Valencia winning the game. And the title. After Valencia entered the game with a 0 – 11 run, Thomas rallied his players with a couple of shots that helped his team erase that deficit. He then continued firing to score 16 points in the first half. His team went to the locker room up and never looked back afterward. “There is so much joy and excitement, so much work has gone into this season and through all the ups and downs, we really showed our character tonight. starting off the game 0-11 and coming back and having this performance says a lot about our team and a lot about our leadership on this team,” Thomas mentioned. That comeback from down 11 was discussed by most Valencia players in their post-game comments. We had a difficult start in the game, losing 0-11, but we kept fighting and playing together with these fans here and we won this tournament,” said veteran Fernando San Emeterio. The Spanish player finished the match with 18 points. “We were down 0-11 but looked at each other in the eyes and started to play our game. In the end, we showed that we are a good team, the best team on the court.”Bojan Dubljevic remarked after contributing 18 points and eight rebounds. This was the second EuroCup trophy for Dubljevic after winning the title in 2015, also with Valencia.